This Ramadan, Innovative Minds and the Islamic Human Rights Commission have launched a "Ramadan Boycott For Justice" campaign in the Muslim community to weed out any boycott-breakers - collaborators with injustice - among the Muslim community. 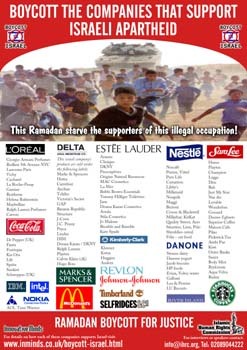 Please help us by launching your own Boycott Israel drive in your local mosque or community this Ramadan. Provided below is a leaflet showing which companies to boycott.Please download it and distribute copies in your community. The format is PDF and is created at hi-resolution for printing at 300dpi on A4 paper.